Sometimes travelling to a new place may get challenging! 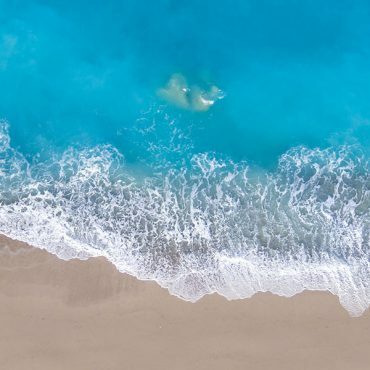 That’s why we wanted to provide you with an insider travel guide of Koufonisia, featuring the best restaurants, bars, and beaches. Koufonisia is a complex of two islands: Pano Koufonisi which is inhabited and Kato Koufonisi with is totally uninhabited and accessible only by boat. 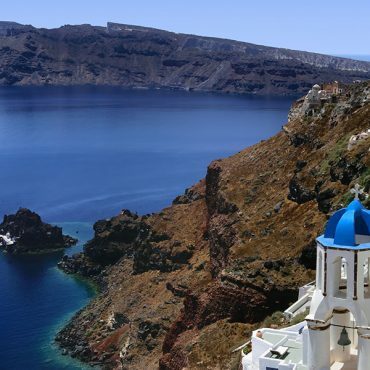 The island belongs to the complex of Small Cyclades, along with Donoussa, Schinoussa and Iraklia. It is considered to have the most beautiful beaches of Greece. The capital of Ano Koufonisi is a typical Cycladic area with whitewashed houses and wooden colorful doors. Keros island: It is one of the most important archaeological sites in Greece, featuring a series of monumental antiquities such as the impressive statuette of Great Mother and the remnants of a Cycladic cemetery. The Eye of the Devil is a hole inside the cave that communicates with the sea. It is located between the beaches of Pori and Italida. 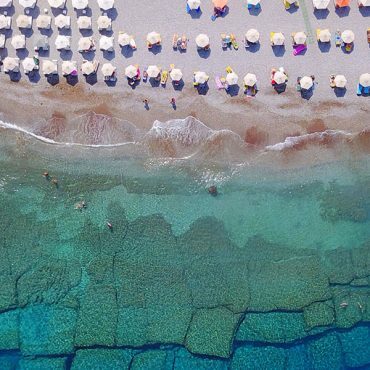 Visit the beaches of Kato Koufonisi. ‘Nero’ is among the best beaches in Kato Koufonissi. It has exotic water and soft sandy shore. Excursion boats from Pano Koufonissi go to this beach. Sail to Kato Koufonisi, where you can find unspoiled beaches with mesmerizing waters. 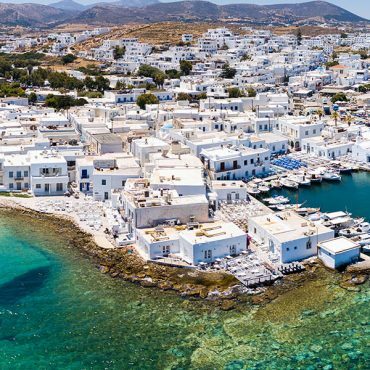 Sail to Keros which is an island full of history and amazing waters. South of Keros on the side not visible from Koufonisi there are 8 uninhabited islets and Antikeros is one of them. All of them have small coves ideal for dives from the boat. North of Pori beach there is a cove called Xylobatis with two sea caves. You can swim into the caves. Sail to Glaronisi which is an amazing island surrounded by aquamarine waters and with several small pretty beaches. 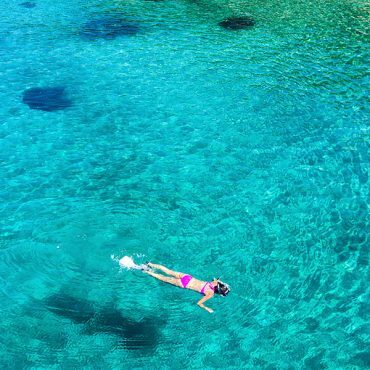 Sail on the two islets called Makares, surrounded by crystal clear, aquamarine waters and with beautiful beaches. Parianos, in the Pano Koufonisi (upper), is the only harbor in the islands. It provides good shelter from the meltemi. It is a small harbor with 5-6 m depths at its entrance, and 3-4 m in its middle. Near the mole it can be less than 2 m. Anchor in the middle and take a liner ashore. The village is within a 15-20 minute walk. Be careful, there may be a number of floating ropes from the fishing boats. Finikas cove in Pano Koufonisi provides reasonable shelter from the meltemi but is exposed to the south. There are many campers on the beach. Anchor in 4-5 m on a sandy bottom. The village is near by. A small harbour has been created by adding walls to SW side of the ferry jetty. Some fixed lines are in place to the jetty and other boats are directed to lie alongside the other walls by the harbourmaster. Shelter is good in most conditions. Water and electricity available. Anchorage in NE Bay which is near the north-east tip of the island. It provides some shelter from the meltemi but is open to the east. Sandy bottom. Pori is one of the best beaches in Greece. It is a gorgeous beach with soft sand and crystal water. It is located on the north eastern side of the island. Gala is a small pebbled beach, like an open cave which connects to the sea through a narrow opening. Ask the locals or follow the crowd form Pori beach to find it! Caves before Pori. This is a large rocky place with crystal water. 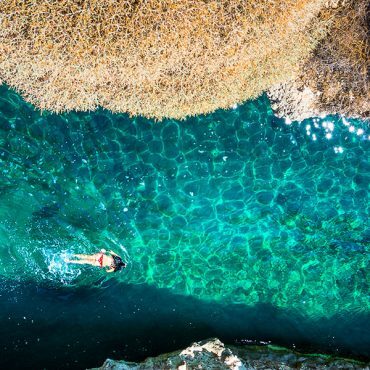 People usually dive from the rocks into the blue green sea. Pisina is a small natural phenomenon created by a rocky cliff above the sea. It is located between the beaches of Pori and Platia Pounda (Italida). Platia Pounda also known by the locals as Italida (Italian) is a sandy beach of emerald waters located after Fanos beach. As mentioned above, Pori is one of the best beaches in Greece and a perfect spot for windsurfing. Captain Nikolas Tavern is one of the best seafood places around overlooking the harbour at Loutro. Let the welcoming owners show you what’s been freshly cooked, or help you select a fish for grilling. The lobster salad is famous and the seafood pasta delicious. Captain Dimitris is also a very good choice if you want to taste seafood. Gastronautis serves traditional Greek. Located on the narrow, whitewashed main street. Try tuna tartar, intriguing ‘salty doughnuts’, or pork chops in a barbecue sauce. Sti Strofi is the place if you want to taste the best souvlaki in Koufonisia. Kalofego is a nice beach bar in Pori beach, perfect for early lunch and cocktails by the sea! Karnagio Restaurant is a very nice fish tavern. Accompany your food with ouzo! Michailos Grill House is known for its meat! Bakery of Giorgoula is the best place to taste traditional Greek pastries. Kyma is known for the traditional Greek donuts with honey also known as loukoumades. Sorokos Bar is the place to be for early drinks and cocktails. Koufohorio and Astrolouloudo located on the main narrow street serves drinks and authentic traditional Raki. Make sure to go early in the evening to secure a seat. En Plo is perfect choice for cocktails.